When it comes to tough, the Beadlet Anemone takes the cake... it's one of the most durable anemones you can find! The Beadlet Anemone Actinia equina is one tough little dude. This hardy sea anemone can handle a wide variety of temperatures and salinity levels. But that's not all, it can also be left out of water for periods of time. It will survive just fine as long as it doesn't totally dry out. It will typically close up to retain water when exposed to the air, resembling a little slimy blob. It is one of the two best known Actinia species, with the other being the Australian Red Waratah Sea Anemone A. tenebrosa. The two are commonly confused, and often mislabeled, but the Beadlet Anemone is the one that is most often available and typically what an aquarist purchases.This is fortunate, as the Beadlet is a tropical anemone, typical of most captive environments, while the Red Waratah Anemone needs much cooler water. This Anemone is an amazingly pretty member of the Actiniidae family. It is usually a uniform blood red color, though there are also wide variations of tan, brown, purple, green or orange hues. There is also a green color, but it has been suggested that this may be a different species, the Green Beadlet Anemone A. prasina. Some other common names it is known by are the European Sea Anemone, Red Sea Anemone, Horse Anemone, and African Beadlet Anemone. The small, durable Beadlet Anemone only grows between 1 to 2.75" (3 to 7 cm), with the average size being 1.9” (4.5 cm). It can readily be kept in a small nano reef of just 20-gallons or more. Give it a typical reef environment with proper care and feeding, and it can do well. With the correct husbandry they will also reproduce in captivity. They reproduce internally and give birth to live baby anemones that can be a variety different of colors. Thus they make their own unique display in the aquarium. 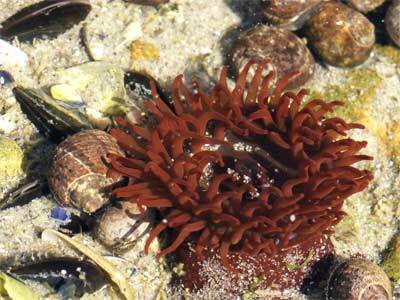 The Beadlet Anemone Actinia equina was described by Linnaeus in 1758. The Actinia genus, described Linnaeus in 1767, belongs to the Actiniidae family and currently contains over 60 species. The Actinia genus is found in inter-tidal zones, lower shores and sheltered areas. They inhabit shaded vertical rock walls and tide pools, usually in groups. They feed on food particles at high tide, and at low tide will enclose themselves into a little jelly blob to keep from drying out in the open air. They use their venomous cells or nematocyst found in their tentacles to sting and deflect any possible threats or attacks. Actinia species have reproduced in captivity. Beadlet Anemones are found in subtropical waters in the Mediterranean and in the colder waters of the Eastern Atlantic Ocean around Britain and Ireland. They are not usually in water more than 65 feet (20 m) deep. They have been seen in estuaries, indicating a tolerance for fluctuations in salinity. They are found in a wide range of temperatures from 35 to 82° F (2 - 28° C). This anemone can tolerate warmer waters, typical of most captive environments. They are not listed on the IUCN red list for endangered species. Other common names they are known by include the European Sea Anemone, Red Sea Anemone, Horse Anemone, and African Beadlet Anemone. The Beadlet Anemone lives at the water line in areas that are sheltered, such as harbor walls (green variety) and in inter-tidal zones (red variety). They stick to rocks only a few feet from the surface or to rocky bottoms that are just below the tide line. Beadlet Anemones are solitary and feed on zooplankton and small prey that they sting with their tentacles. Like all of their genus, they feed at high tide and enclose themselves into a little jelly blob at low tide. They also tend to only open at night, so are often contracted during daylight hours. The Beadlet Anemone only reaches between 1 to 2.75" (3 to 7 cm) in diameter, with the average size being 1.9” (4.5 cm). They will also reproduce in captivity, but it is unknown how long they live. In fact, some anemones can be hundreds of years old in the wild, and in captivity have been known to last 80 years or more. The Beadlet Anemone, typical of the Actinia genus, has a pedal column with a sticky foot at the bottom that they use to adhere to various surfaces. The also use this “foot” to move around if needed. The tentacles are arranged in 6 circles around the surface of the oral disc. The body is distinctly separate from the tentacles on the disc by a ridge and adjacent furrow. This is called an "acrorhagi," which has tentacles that look more like bumps and possesses nematocyst cells. The mouth is in the center of the oral disc. The A. equina take food in and expel waste through this same opening. Healthy anemones have a mouth that is closed and tight. It will open when hungry, having an oval look, yet a gaping mouth is a warning signal. In low tide, the anemone will close up to retain water when exposed to the air, resembling little slimy blobs. They also tend to only open at night, so are often contracted during daylight hours. The Beadlet Anemone is variable in both form and color. Its color is usually a uniform blood red color but there are variations of purple, tan, brown, green or orange. The oral disc does not have any pattern on it. Two very distinct forms include one that has a purplish-blue acrorhag with 192 tentacles and can reach 2.75" (7 cm). Another is brownish red with 124 tentacles, and reaches only 1.18" (3 cm). It has been stated that the green color may be A. prasina. Australian Red Waratah Anemone, A. tenebrosa. It was described by Farquhar in 1898 and is found in New Zealand, in the Shark Bay in western Australia at depths of 16 feet (5 m) or more, and in Tasmania in cold waters ranging from 50° to 68° F (10° - 20° C). They inhabit shaded vertical rock walls and tide pools, usually in groups. A. tenebrosa is generally bright red in color and is small, only getting to 1.5” (4 cm). This colder water species is named after the Waratah flower, which is the state emblem for NSW, Australia. This anemone is also known as the Cherry Anemone, Waratah Anemone, and Red Waratah Anemone. Strawberry Anemone, A. fragacea. It was described by Tugwell in 1856. They are found from Norway to Africa and adjacent Islands, and in the Mediterranean. They occur in cold waters and are found on rocks in lower shorelines from 26 to 33 feet (8 to 10 meters). A. fragacea are red or dark red, with spots of green, yellow or blue. At one time this anemone was considered a variant of the Beadlet Anemone, A. equinas, however, they are larger, with a base diameter up to 3.9 (100 mm). Don't confuse the Beadlet Anemone with the Australian Red Waratah Anemone. Their requirements are much different, the Beadlet is subtropical while the other needs much cooler water. The two are commonly confused, and generally mislabeled, but because the Beadlet is the one most commonly available, it is the one most aquarists purchase. Size of organism - inches: 2.8 inches (6.99 cm) - The average-sized Beadlet Anemone is 1.9” (4.5 cm). The Beadlet Anemone is moderate to difficult to care for since some do have cold water needs. Those will need a chiller, and all anemones must have proper lighting. Putting an anemone in a new tank will result in failure. A saltwater aquarium should be at least 9 months old and stable before adding a new A. equina. When choosing your Anemone, make sure the color is good, their mouth is not gaping open, and their foot and tentacles are sticky to the touch. They should also be attached to something. Make sure there is no damage to the foot area, as this is often a result of pulling the anemone off its surface. To transfer an A. equina anemone from another aquarium, use a very thin blunt item like a credit card to get under the foot. Slowly nudging it away will get the anemone off the glass. If its attached to a rock, ideally you can simply purchase the rock as well. If you cannot purchase the rock, while under water, directing water at it or wiggling the rock gently upside down while tickling the foot can work. Aquarist Experience Level: Intermediate - Depending on the specimen, it will need a subtropical or cooler tank. The Beadlet Anemone a carnivore. In nature, they use their tentacles to sting and capture prey, often careless fish and invertebrates that bump into them. In captivity hand feed your Actinia anemone minced mussel flesh, shrimp flesh, and tubifex worms. Their metabolism is not as fast as warmer water anemones. They are cooler water creatures, so usually only need to be fed 2 to 3 times a month. However, you may find they eat more often in a warmer water environment. Use good judgment, if they seem hungry more often, then feed them as needed. Live foods (fishes, shrimps, worms): Some of Diet - Marine sources. Liquid Foods: Some of Diet - Marine snow and zooplankton. Meaty Food: All of Diet - Minced marine flesh. Feeding Frequency: Seldom - Due to their cool water/slow metabolism, feed once or twice per month unless in a warmer water tank they seem hungry. Water changes of 10% bi-monthly or 20% a month are typical. Monitor your water quality for your particular situation and adjust your water changes accordingly. Waste production created by your anemone can be calculated in inches. Basically, every inch of anemone is equal to an inch of fish, so an average-sized Beadlet Anemone of 1.9” produces a bio-load equivalent to that of 1 or 2 small fish. Water Changes: Weekly - Water changes of 10% twice a month, or 20% a month are typical. The Beadlet Anemone is quite small, so it can readily be kept in a nano reef of just 20-gallons or more. A typical live rock/reef environment is best, as they need live rock or some other solid material they can attach to. You can even use submersed bio-balls. Because calcium doesn't need to be as high in cold water, providing reef rock for calcium is actually not necessary. Because bacterial formations take a very long time in cooler water, the most important thing for the nano reef is mechanical and chemical filtration. Provide a good skimmer and use filter floss and chemical additives, such Chemi-Pure, GFO, and carbon in the filter to help keep the water clean. Chemi-Pure helps remove heavy metals, copper, phenol, ammonia and other nitrogenous waste. It also helps keep the pH at a consistently safe range. Granular ferric oxide, or GFO, helps with phosphate control. The addition of a refugium with a deep sand bed can help maintain normal parameters, too. They need moderate water movement and average lighting. The light emitted from LED and t5 fixtures puts off less heat, which is essential with a cold water tank. The temperature can be between 55 to 60° F (12.7 to 15.5° C), but whatever temperature you choose, keep it stable as fluctuations can be stressful to the anemone. A chiller will be needed, but this allows you to have both inter-tidal and sub-tidal animals. Acrylic tanks are best for insulating against temperature fluctuations, each 1/2" will give a thermal barrier of 5° F. Be sure to have all of your pumps covered, most good quality pumps have guards on them. Minimum Tank Size: 20 gal (76 L) - These anemones can be kept in 20-gallons (76 L) or more. Suitable for Nano Tank: Yes - A nano tank is fine if no other fish or corals are kept with the Beadlet Anemone. Live Rock Requirement: Typical Amount - Can use less if there are bio-balls. Temperature: 35.0 to 82.0° F (1.7 to 27.8° C) - Depends on the specimen. Water Region: All - These anemones will move about at times, sometimes inhabiting the upper regions of the aquarium's rock structures. Since the Beadlet Anemone likes to move around and reproduce, they are best kept in their own tank. The Actinia anemones are very aggressive because they can be mobile and can sting stationary corals. They will often move, stinging and eating neighboring anemones as well. Putting these in a reef environment with other corals is not suggested due to their reproductive process. You may wake up one morning to find a bunch of babies all over your tank, stinging all of your corals. After reproducing, these anemones will tolerate their own offspring, but will devour other Actinia anemones that are unrelated. Do not buy a clownfish to host with this anemone, it will be eaten. Avoid adding fish, as they will eat small fish including clownfish. This anemone does not host clownfish, and if it does, it will probably end up eating it. Same species - conspecifics: Sometimes - They will tolerate their own offspring. They will attack others. Starfish: Monitor - Subtropical or temperate water species only that are reef safe. Feather Dusters, Bristle Worms, Flatworms: Monitor - Subtropical or temperate water species only. Clams, Scallops, Oysters: Monitor - Subtropical or temperate water species only when kept away from the Beadlet Anemone. Snails: Monitor - Subtropical or temperate water species only. Nudibranch, Sea Slugs: Monitor - Subtropical or temperate water species only. Avoid predatory species. Copepods, Amphipods, Mini Brittle Stars: Safe - Subtropical or temperate water species only. The Beadlet Anemones will multiply on their own, but there is no information as of yet on propagation techniques developed for A. equina. The Actinia genus reproduces by viviparity, which is why these anemones need their own aquarium. Viviparity is basically where each anemone can produce 12 to 100 fully formed live baby anemones. They give birth all at once, dispersing the juveniles all over the water, where they immediately attach and start feeding. Some say that they use an internal laceration. Ease of Breeding: Easy - They multiply on their own. Beadlet Anemones are pretty durable once they settle in. Problems are pretty minimal unless your lighting, water movement, feeding and/or water quality is low or inadequate. In that case, your anemone will detach to look for "better conditions." This usually results in an unpleasant experience with a water pump. Some predators can be other anemones, nudibranchs, sea stars and some angelfish. The Beadlet Anemone, as well as other species in the Actinia genus are easy to find in stores and online, and are moderately expensive. Note that the Beadlet Anemone A. equina, the one being discussed here, is recommended for warmer water aquariums, not the Australian Red Waratah Sea Anemone A. tenebrosa, which is a cooler water anemone.